On the hills of Devonʼs beautiful Dartmoor there is a horseman working on his 4-year-old horse. This man is no ordinary horseman. He is what most people would term as a ʻhorse whispererʼ, one of those people with that rare gift to be able to communicate, connect and understand horses on a different level to most others. It looks like magic to see Garry Stevens working with any horse, the way the horse becomes submissive ʻhooking onʼ in such a willing way and looks to Garry for guidance and leadership. Garry states its no magic but simply understanding the horseʼs psychology and the way a horses mind works. This communication with the horse is done in a way that the horse understands clearly. Garry has touched the lives of thousands of horses, giving a great many of them a second chance in life. He looks at every horse as a unique individual and treats them as such, instantly understanding each horseʼs unique personality, and as he does this he becomes ʻat oneʼ with the horse. “With every horse I am working with I try to treat them with empathy, relating to the problems each horse faces but always remembering the horse is a natural prey animal and will perceive and think things through differently to the way a human would,” says Garry. “So things need to be seen through the eyes and mind of a horse”. The term ʻhorse whispererʼ dates to an early 19th century Irish horseman who had made a name for himself in England rehabilitating troubled horses. But since Devon author Nicolas Evanʼs book “The Horse Whisperer” and the film that followed, the phrase has been used to describe trainers who have developed methods to work respectfully and gently with horses. Many of Garryʼs clients refer to him as Devonʼs Horse Whisperer and he does not consider it to be a bad definition in many ways, but he considers the basis of his work with horses to be simply good horsemanship practices and skills — hence the name of his business. 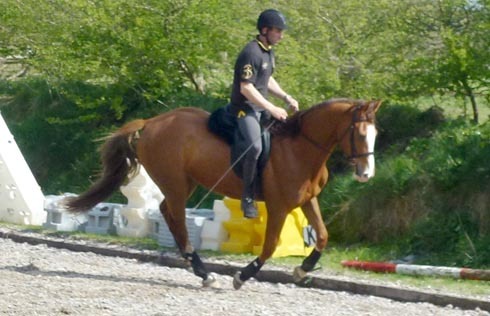 Although Garry is based in south Devon he travels to different areas of the UK on a regular basis and is happy to help with all things equestrian including trailer loading, training of horses and horsemanship coaching.